So it's almost the middle of May and we are still waiting on spring turning up. Let's not kid ourselves, the weather has been awful this year. 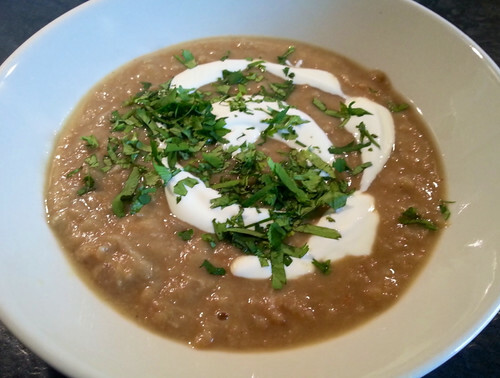 In fact the weather has been so poor recently that when this soup recipe caught my eye when I was flicking through my Olive Magazine, I knew that I had to try making it for lunch this weekend. Heat a little olive oil then cook the onion, garlic and ginger for a few minutes until softened. Add the carrot and spices for a further two minutes. Add the chicken stock and simmer for 5 minutes. At this point, add the butter beens and cook for 10 more minutes. Ladle half of the soup into a blender or food processor and blitz until smooth before pouring back into the pan and gently reheat before serving. To serve, split between two bowls and swirl a little soured cream over the top before scattering with some fresh chopped coriander. Delicious! Soup making isn't something that i'm usually that good at so I am please to say that this was a tasty, quick and easy recipe that i was able to prepare using ingredients that are always in the fridge and cupboard that I will definitely be making again, regardless of the weather. Next time I might leave the soup chunky, or maybe try using cannellini or berlotti beans instead of the butter beans. This recipe has become my current favourite soup recipe but I would be interested in hearing what soup recipes get your taste buds buzzing?